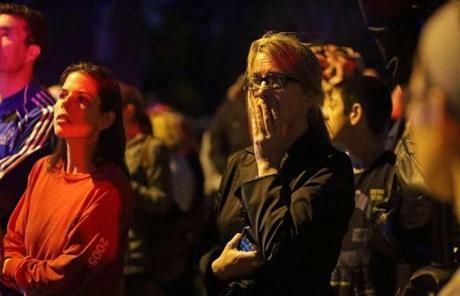 Crowds gathered at the Boston Common after a manhunt that gripped the area ended with Dzhokhar Tsarnaev's apprehension. 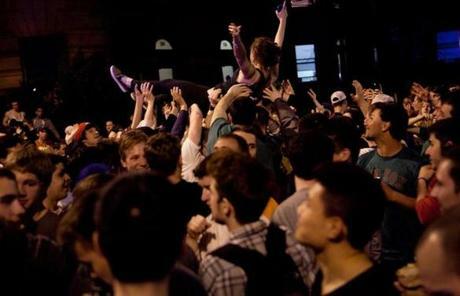 About 200 people poured onto Hemingway Street in the Fenway neighborhood to celebrate the capture. 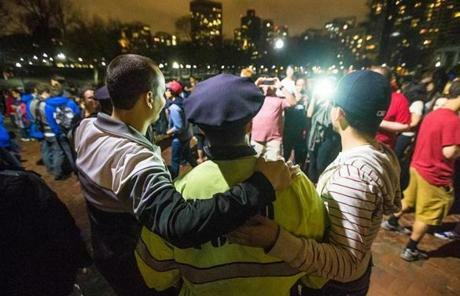 Boston Police officers were thanked during a celebration of the capture of a Marathon bombing suspect. 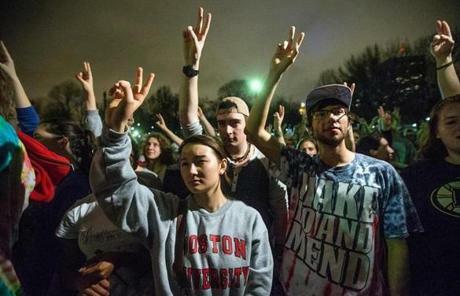 Yasmin Gentry (from left), TJ Dolan, and Hunter Stetz held their hands up during a moment of silence in the Boston Common. 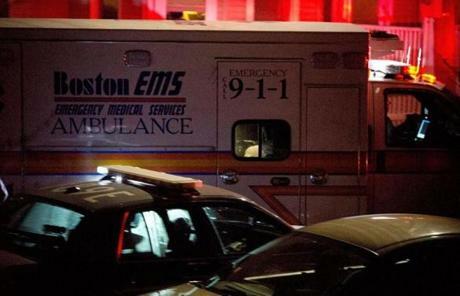 An ambulance carried bombing suspect Dzhokhar A. Tsarnaev from Watertown after he was apprehended. 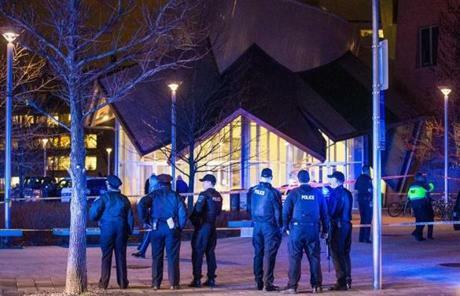 Police stood guard outside Beth Israel Deaconness Medical Center's West Campus where Tsarnaev is being held. Eric Sidiropoulos, 26, of Watertown joined crowds lining Mt. 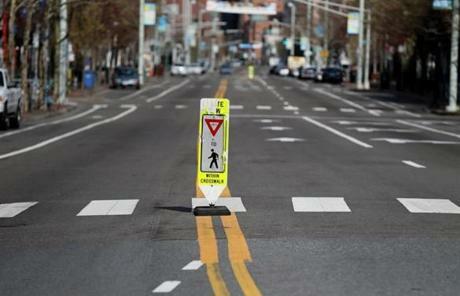 Auburn Street to cheer first responders after the capture of Dzhokhar A. Tsarnaev. 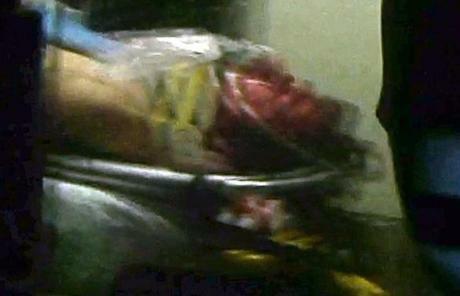 A still frame from video shows Dzhokhar A. Tsarnaev visible through an ambulance window. Louise Hunter and others cheered police on Arsenal Street after the capture of the bombing suspect. 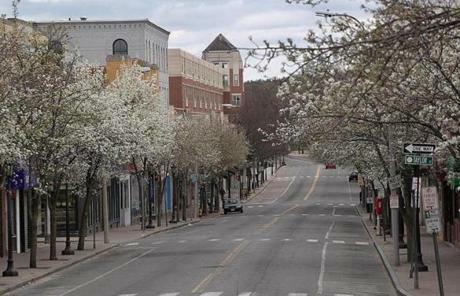 Residents cheered on Arlington Street in Watertown. An officer and woman celebrated after the capture. 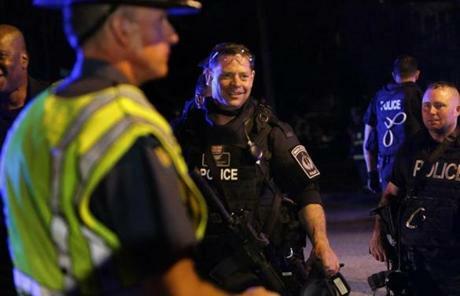 Law enforcement officers were visibly relieved after the capture of Dzhokhar A. Tsarnaev. 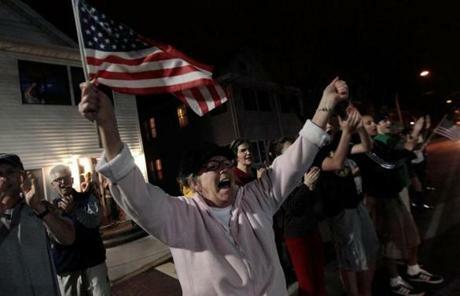 Residents along Arsenal Street in Watertown cheered police after the capture of Dzhokhar A. Tsarnaev. 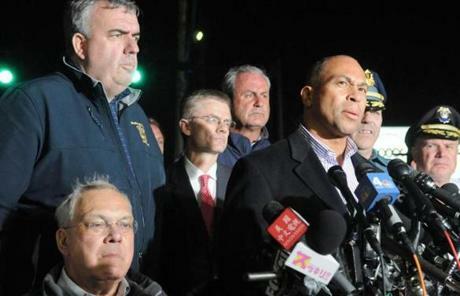 Governor Patrick spoke after Tsarnaev’s capture, flanked by Mayor Menino and other officials. 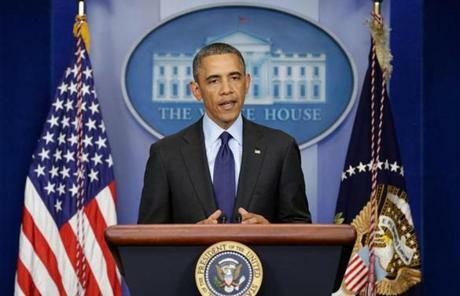 President Obama spoke from the White House after Tsarnaev was captured. 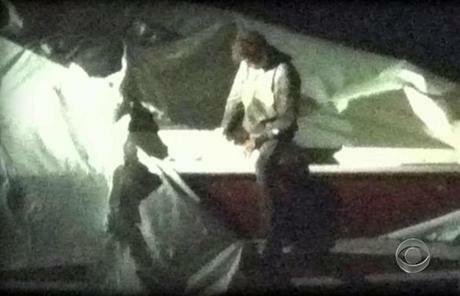 This image shows Tsarnaev, who was captured after being found hiding in a boat in a Watertown backyard. 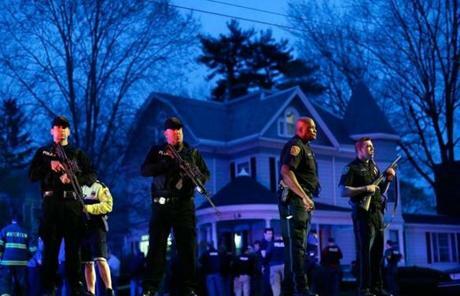 Officers approached an area in Watertown where the second bombing suspect was hiding. 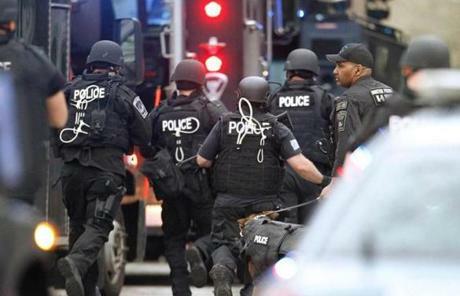 Law enforcement agents closed in on Dzhokhar A. Tsarnaev. 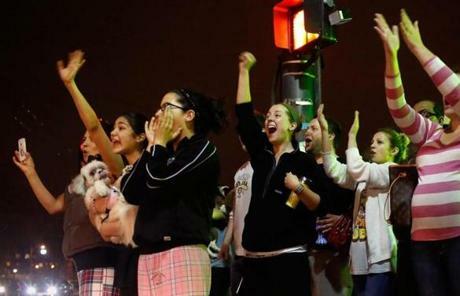 Onlookers watched the events at the intersection of Mount Auburn and Franklin streets in Watertown. 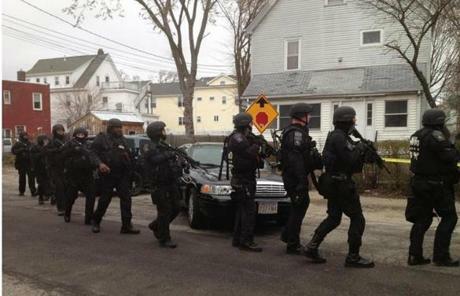 Officers from many agencies descended on an area around Franklin Street in Watertown. Officers guarded the entrance to Franklin Street. 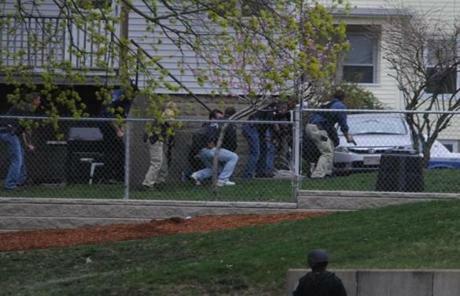 Officers ran toward an area in Watertown where the second bombing suspect was hiding. 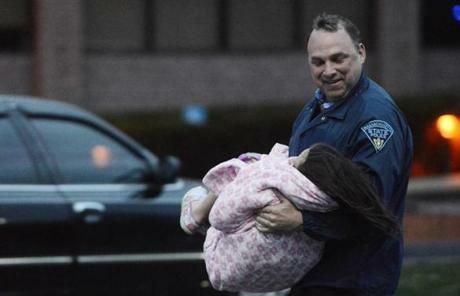 An officer evacuated a child away from an area where a suspect was hiding on Franklin Street in Watertown. 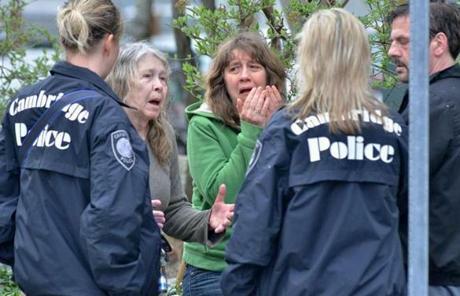 A family reacted after police assaulted a house on their street in Watertown during a search for Dzhokhar A. Tsarnaev. 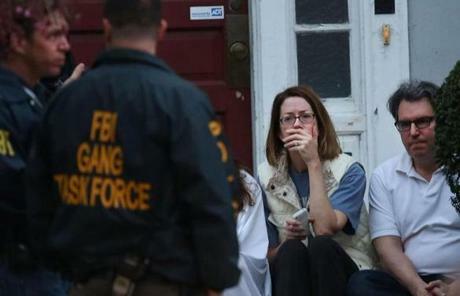 Residents in Watertown fled the scene where Dzhokhar A, Tsarnaev was hiding. 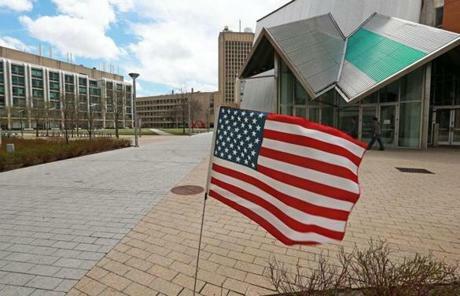 An American flag fluttered at the scene of the murder of MIT police officer Sean Collier. The roommate of slain MIT police officer Sean Collier spoke to the media outside his residence in Somerville. He would not give his name. A nearby family brought items to give to the home where Sean Collier lived. 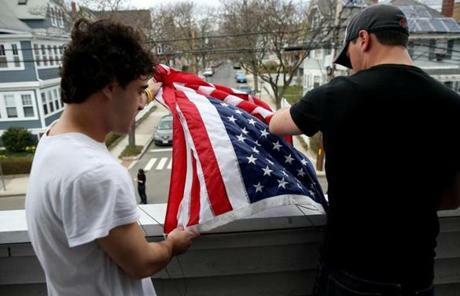 Tufts University students Thomas Isman, left, and Gary Grandonico hung a flag at their house, next to the home of Sean Collier. 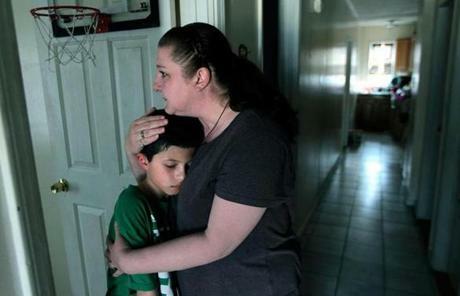 Michelle Blain comforted her son, 10-year-old Louie Blaine-Santos, at their home in Watertown. 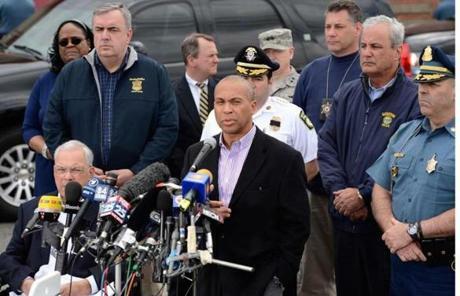 Governor Patrick and Mayor Menino conducted a press conference at Watertown Mall Friday afternoon with other officials. 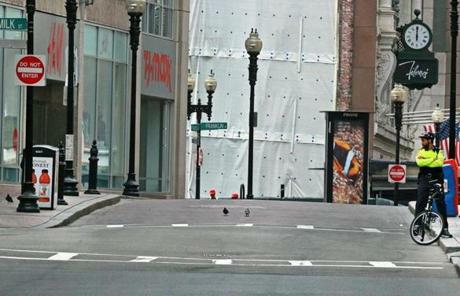 Streets near Downtown Crossing were empty at midday Friday. 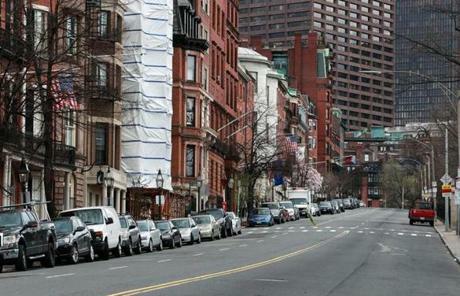 Congress Street in the Financial District at about 11:45 a.m.
Beacon Street looking toward the State House. 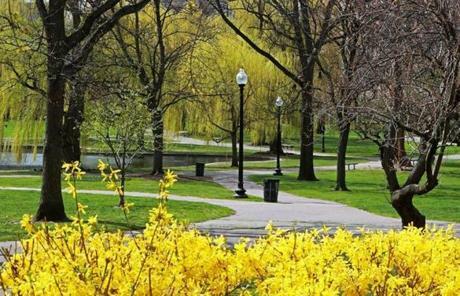 The Boston Public Garden at about 10:50 a.m. Friday. 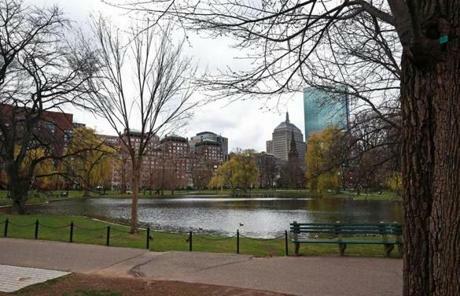 The scene at Boston Public Garden at 11:15 a.m. Friday. 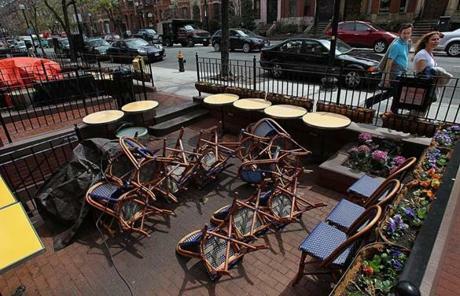 Chairs at a restaurant on Newbury Street were blown over by the wind. The street and restaurant normally are crowded with people at midday. A deserted Moody Street in Waltham. 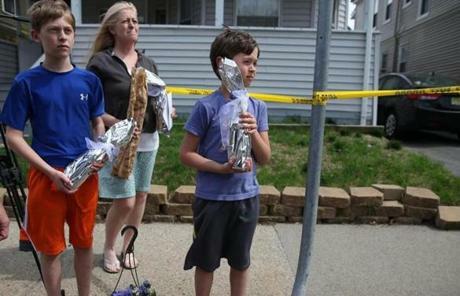 Two Watertown residents looked out their window. 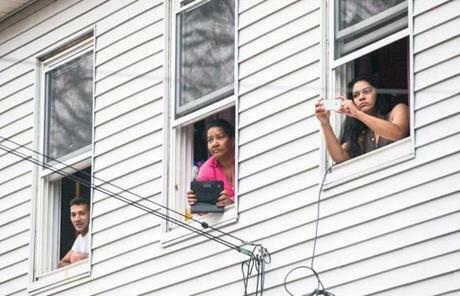 Katia Costa looked out her window at police activity in Watertown. Bridgewater State University was evacuated when an unattended backpack was seen under a car. Later, a student approached and said the bag was his. He retrived it and removed its contents. Officers took two men into custody on Norfolk Street in Cambridge Friday morning. 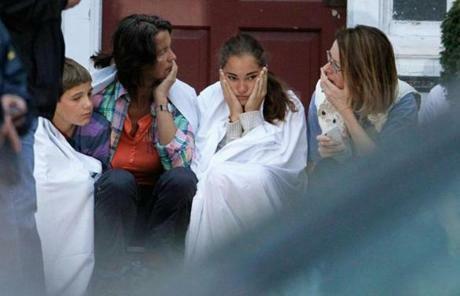 A pair of women who were neighbors of the suspects on Norfolk Street in Cambridge reacted as they spoke to officers. 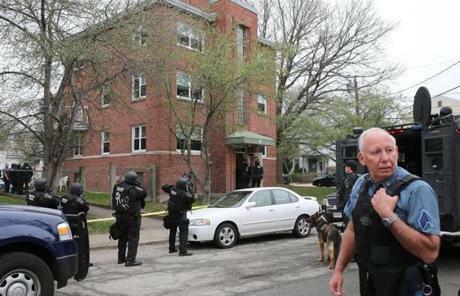 Police searched a building in Watertown. 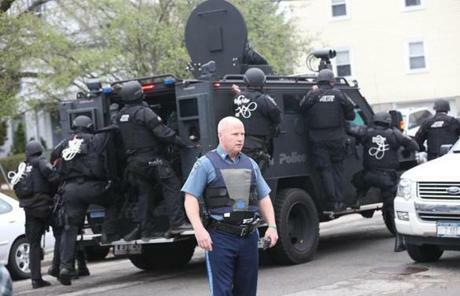 Police took up positions in Watertown. 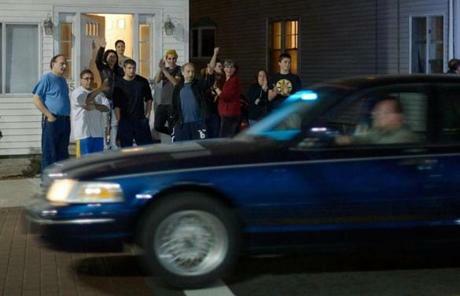 Residents watched police in front of a building in Watertown. 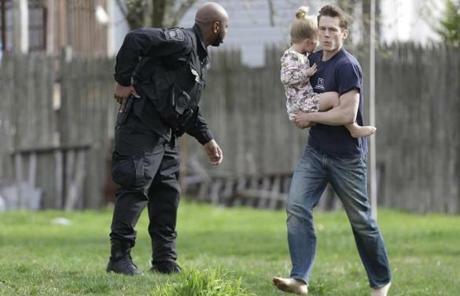 Police evacuated a neighborhood in Watertown Friday as they searched for the second bombing suspect. 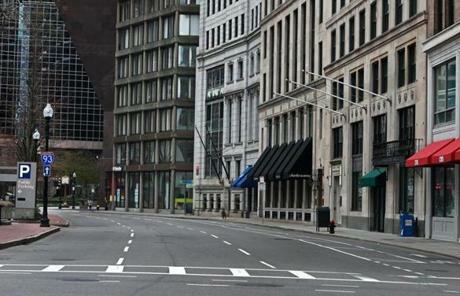 Streets in Cambridge were nearly empty amid the manhunt. 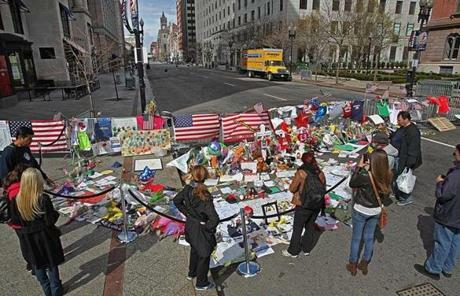 The memorial at the intersection of Boylston and Berkeley streets had a few visitors during the lockdown Friday. 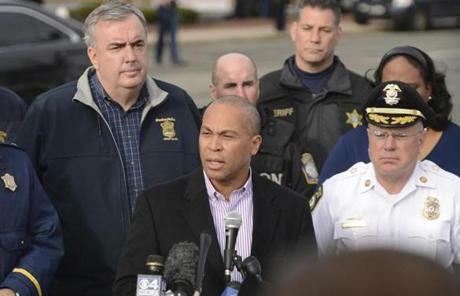 Governor Patrick addressed members of the media during a press conference at the Watertown Mall. 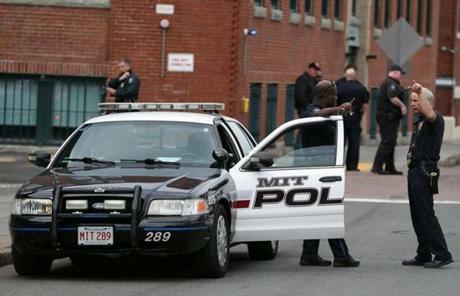 An MIT police officer stood by his cruiser Friday. 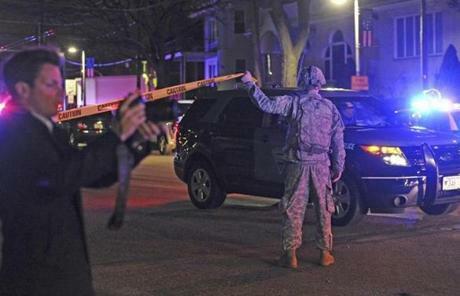 Late Thursday, MIT officer Sean Collier was shot and killed. 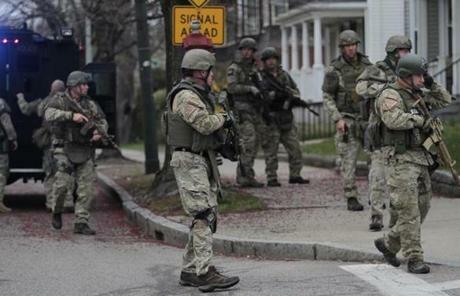 SWAT teams moved into position in Watertown Friday morning during a manhunt for one of the Marathon bombing suspects. 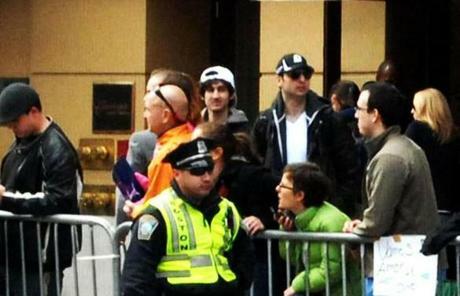 The bombing suspects are seen together Monday in this photograph at the Marathon finish line. 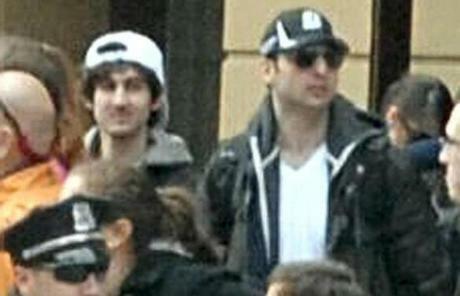 Authorities are searching for Dzhokhar Tsarnaev, the suspect seen in FBI photos in a white cap. 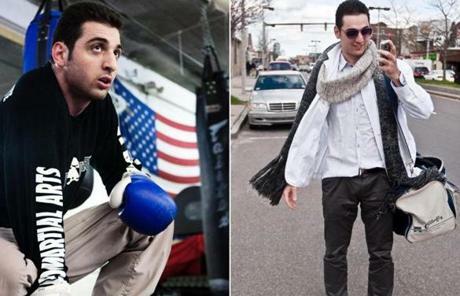 In two photos from 2009, Tamerlan Tsarnaev is shown inside the Wai Kru Mixed Martial Arts center in Boston (left) and arriving at the center (right). 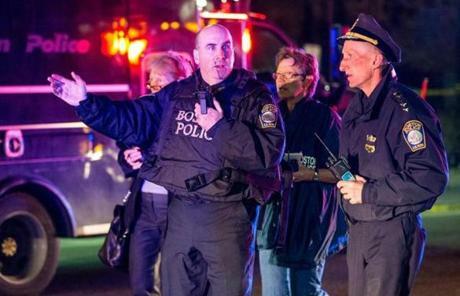 The suspected Marathon bomber died after a shoot-out with police Thursday night. 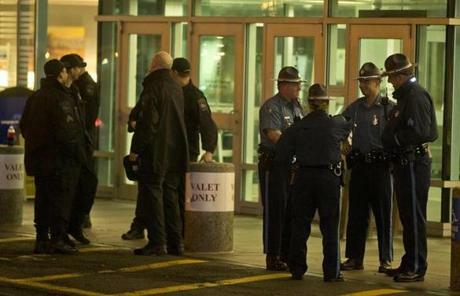 Police searched for a suspect in Watertown early Friday. 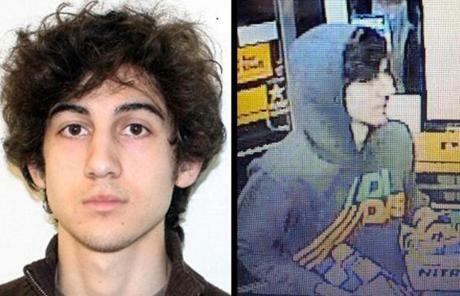 Dzhokhar A. Tsarnaev was known as the “white hat” suspect. 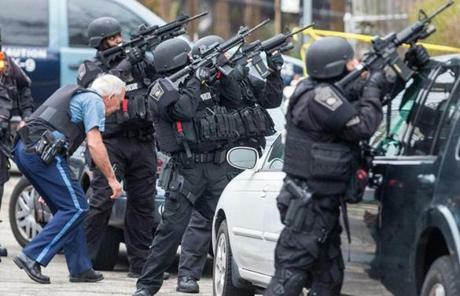 The “black hat” suspect — his brother — died in a shootout with the police. 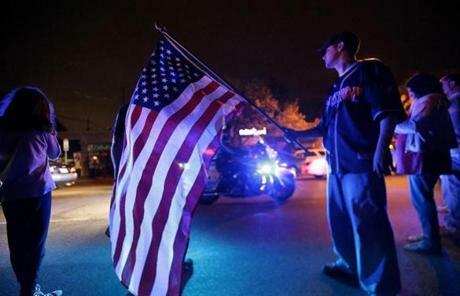 Teams moved into position in Watertown while searching for the Marathon bombing suspect who was still at large. 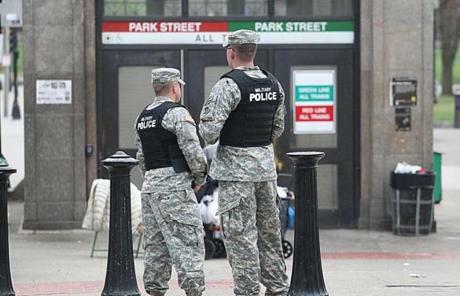 Military police stood at the Park Street T station as the city was locked down during the manhunt for the Marathon bombing suspect. 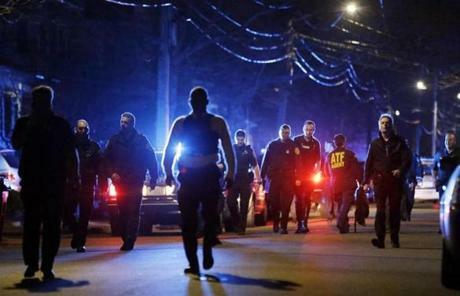 State authorities asked people who live in Boston, Watertown, Waltham, Newton, Belmont, and Cambridge to stay inside and not open their doors to anyone except police with proper ID. 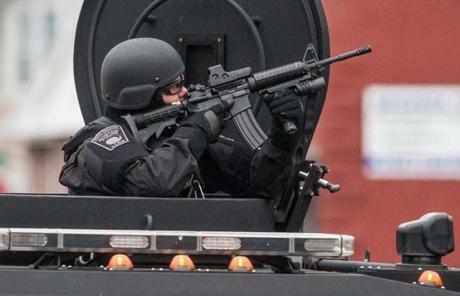 SWAT teams arrived in Watertown Friday as officers searched for the bombing suspect. 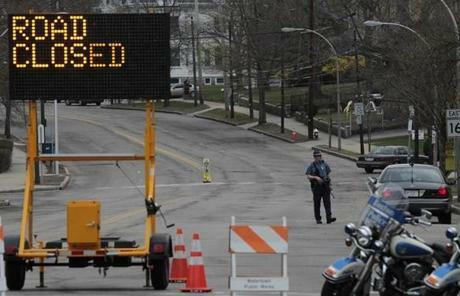 Vehicles were not allowed in or out of Watertown. 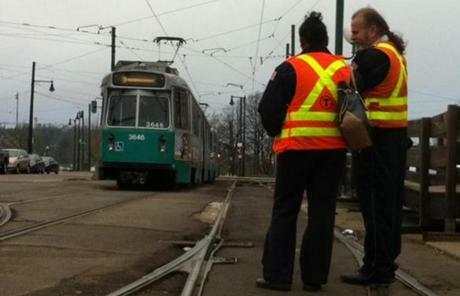 The entire MBTA was closed as the manhunt continued. Amtrak was stopped from Boston to Providence. Taxi service was also suspended. 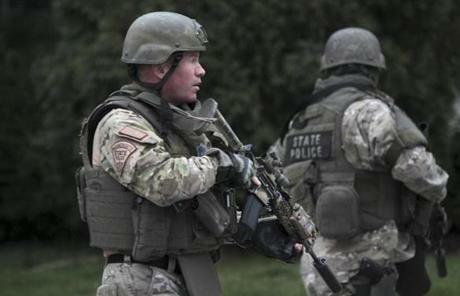 State Police searched for the suspect on Mount Auburn Street near Watertown Square. 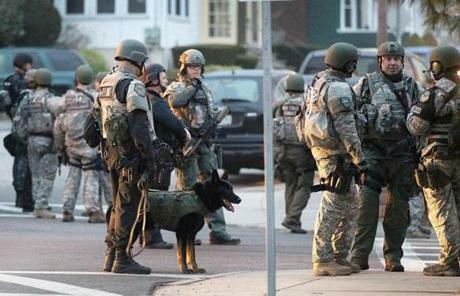 Police with K-9 units prepared to patrol a section of Watertown. 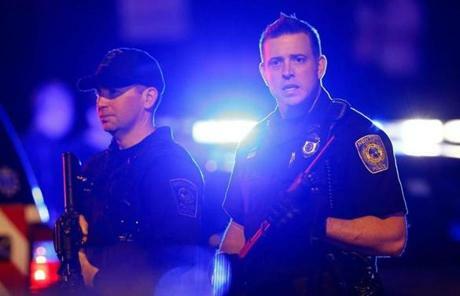 After an MIT police officer was shot and killed, an armed carjacking led police on a chase to Watertown. 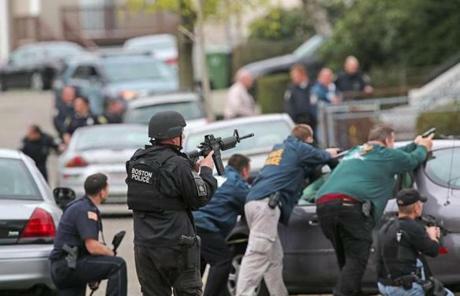 The FBI searched for the suspect in Watertown. 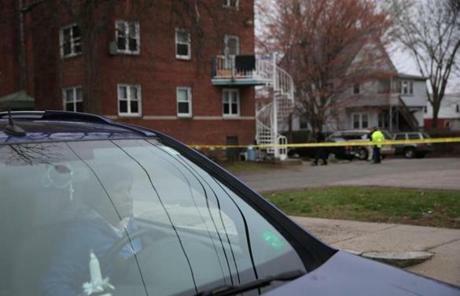 A neighbor watched police activity from her car in Watertown. 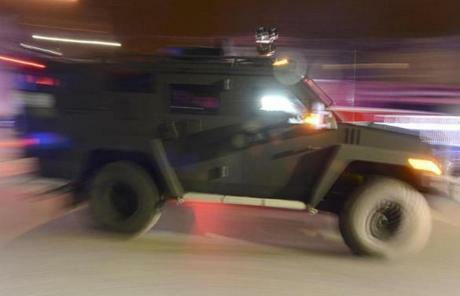 Police warned residents not to leave their homes. 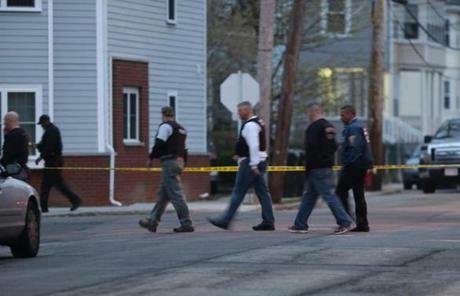 Officials at a crime scene in Watertown. No cars were allowed in or out of the town Friday morning. 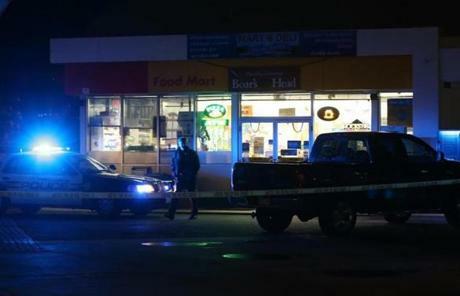 A convenience store at Memorial Drive and River Street in Cambridge became a crime scene after two men carjacked an SUV at gunpoint. The events began with a reported shooting at the intersection of Vassar Street and Main Street in Cambridge. 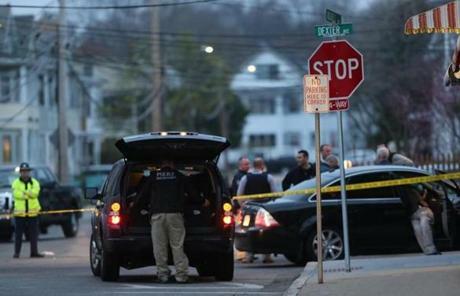 Police were on the scene after a reported shootout on Mount Auburn Street in Cambridge. Police secured the area in Watertown. 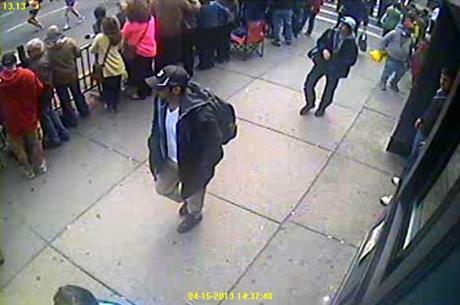 The FBI Thursday released photos and video of two suspects in the deadly Boston Marathon bombings, appealing to the public for help in finding them.